Ice Cream Oreos: Rainbow Shure,Bert! A little blast from the past from my blog at pyropixie.net until I can get everything straightened out over here! 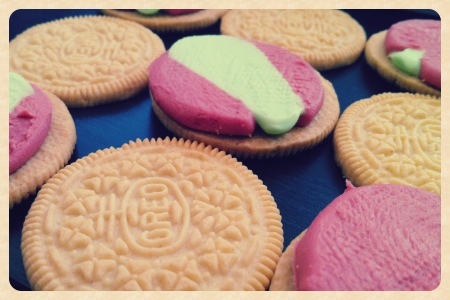 This week we sample: Ice Cream Oreos: Rainbow Shure,Bert! It’s no secret that Richard and I are total snack food junkies. Rarely do we walk down an aisle at a store and find something we haven’t tried, but that doesn’t stop us from looking. Last night during a spur of the moment dash to the Wal of Marts for today’s lunch, we spotted these little babies on an endcap. Snack foodie protip # 375 – always check the endcaps. Both of us have worked in grocery retail for a while (I currently do not anymore). Vendors will often either pay to be on prime endcaps or beg department leads for space for new product. Simply hiding it down the aisle doesn’t move units, thus rarely you see new product thrown directly in the home location from the beginning. Richard: mmmmm…. this smells really good, I could smell this forever. me: mmmmm… it smells really citrus-y. me: *pops whole Oreo into mouth* The flavor is really underwhelming. (please note I said this with a mouth full of Oreo, always the lady). Richard: Yeah I was expecting more of a sher-berty… taste. *I may or may not have paraphrased some of that last paragraph. When he speaks, so much awesome comes out that I can hardly keep up on the keyboard, and this is why I keep threatening to record some of our conversations. I prefer chocolate cookies myself. Give me the ole classic Oreo. Call me a creature of habit, but I will always go back to the old stand by. My package of Shure, Bert! Oreos will probably last me a week or two, but Richard’s on the other hand is probably already gone. If they were the classic version, I would have probably had the entire thing for breakfast, but instead I settled for honey mustard pretzels. Breakfast of Champions I say! Richard: 4/5 – looks well done, not messy and all over the place, appealing. would add another color to the frosting as the pink and green frosting is misleading, making you think that you are going to have a watermelon like treat. Erin: 3/5 – i like the colors, but agree that the two colors does not give me the feeling of eating sherbet, where is the orange?! Richard: 4/5 – very consistent with great taste. I don’t know. sure. Erin: 3/5 – I prefer the cream in Oreos to be a little more firm so that when I twist them apart – my preferred method of eating Oreos, the cream stays on one side. When I twist these apart the cream will lift and trick me into thinking that its going to split in two, which totally bums me out. Richard: 3/5 – I wish there was more of a citrus burst. I don’t even know what I’m saying right now. Erin: 5/5 – Yeah I said, these babies smell good! Richard: 4/5 – It tastes like sherbet, but I feel like the cookie dulls or takes away from the sherbet-y taste. Erin: 4/5 – I agree with Richard that the flavor is a bit weak when combined with the Oreo. All alone its pretty delish.